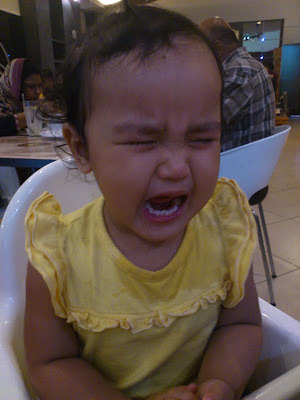 Piya was not behaving well though with her table manners. She is digesting her vicinity as a learning process so we just bore with it the entire evening. But we do pinch her if the behavior is out of lead. I don’t want my children to be monsters.. Sabor jer laaaaaa….. The food we ordered was great! The soup from MFM never fails to indulge my appetite as I am a big fan of soups. Uncle Din’s dish was extremely good that I tend to abandon my plate and aim for his. That’s why I’m fat and his thin. Piya is fond of French fries and rice very much so she was quite happy to binge on those two. Another reason why I’m fat is because I ended up finishing Piya’s plate of rice. meh laaa dtg shah alam mkn MFM....!